The year is 1942, and you are a prisoner of war, incarcerated in a German camp. How will you escape? Guards patrol the camp day and night, but by watching their movements and becoming familiar with the daily routine, and exploring the layout of the camp, you can work out how to minimise your chances of being detected – and if you are caught, you'll be placed in solitary confinement for a while, and any objects you are carrying will be confiscated. 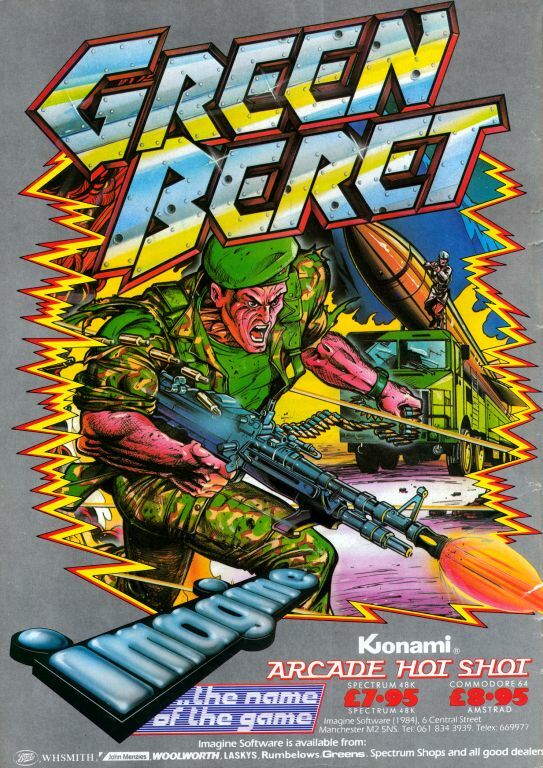 This game is regarded as a classic, but the CPC version is unfortunately a Spectrum port, and it suffers accordingly. 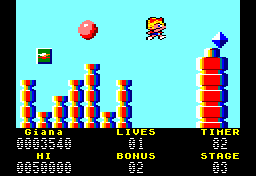 The concept is original, but the isometric graphics are displayed in a single colour, and the scrolling is very slow indeed. As a result, it takes ages to move from one place to another, and I reckon that the majority of players will not have the patience to play it fully. Giana and Maria are dreaming, and in their dream, they enter a world full of platforms and cute monsters which they can kill by bouncing on their heads. Some of the platforms also reveal coins if you hit them with your head. There are also diamonds to collect, but make sure you don't fall off the platforms! Yes, I know what you're thinking. "This is Super Mario Bros.!" It is very similar indeed; in fact, it's so similar that Nintendo sued Rainbow Arts and won, and the game was withdrawn from the shelves after about two weeks, so I suppose it's quite a rare game. The gameplay is as good as its Nintendo equivalent, although the movement is slow and there are no sound effects at all! An early game by programming great David Perry, Great Gurianos is a port of the arcade game Gladiator. You play as Gurianos and must walk along, using your sword and shield to either block or destroy incoming monsters, before taking on a selection of rival gladiators. There are a few nice touches: you can block and strike at three different levels – low, mid and high – adding a bit of strategy to the boss battles; armour disappears from you and your opponents as you battle; and there is an excellent tune on the title screen. 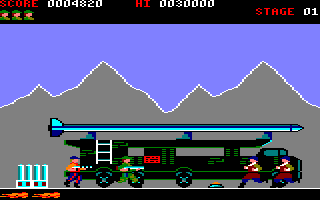 However, the game is criminally difficult, and the graphics are rather bland and empty. The big killer, though, is that due to lack of space to include an ending, Perry made the final boss invincible! This game appeared on one of Alternative's Classic Arcadia compilations; as far as I know, it wasn't released on its own. 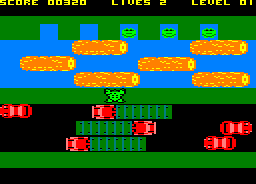 Anyway, you have to guide some frogs safely across a busy road and a river, and place them in boxes on the other side of the river; yes, it's a Frogger clone. You have to manoeuvre the frogs through the gaps in the fast-moving traffic, and then leap across the logs on the river, and time the leaps into the boxes perfectly, otherwise you lose a life and must start the process again. When you have placed five frogs in the boxes, you go to the next level. The graphics are fairly good, and the sound effects are simple, but the second level is too difficult and it's not a game you'll stick with for long. 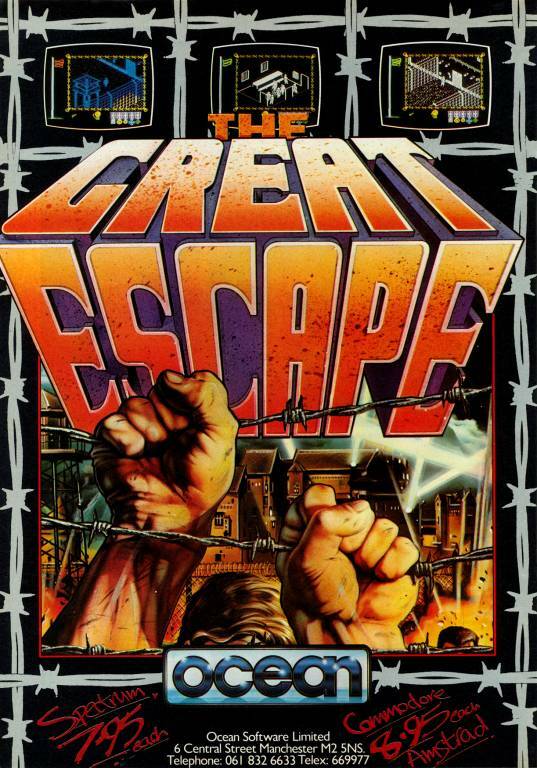 Take on the might of the enemy's forces to rescue the captives in this Cold War platformer. Run, jump and shoot your way past their troops to reach your goal. Any collisions means instant death so it turns out to be quite a job – especially when some of your opponents are armed with guns while you are only armed with your trusty combat knife. Luckily, if you manage to bump off a passing handyman you can pick up new weapon, albeit with limited ammunition, such as a flamethrower or a bazooka, which prove to be considerably useful in a sticky situation. A nice looking game with limited sound, it remains difficult but ultimately frustating. Watch YouTube videos of this game by: Axelino, ChinnyVision, Metr81, Novabug, Xyphoe. Gregory has gone to sleep, but a ghost has come along and taken his alarm clock! He now has to enter his dreams and find the four pieces of the clock before he wakes up again. The first level is set in a warehouse of some sort, and then it's on to a jungle full of strange inhabitants, an art gallery, and finally a battlefield. It's a game which is aimed at younger people and this is clear from the blocky but bright graphics, but there's not much sound, and it's not very good, anyway. The first level is OK but the second level will have you tearing your hair out. As far as I know the world's only 'garden-'em-up', the aim of this oddity is to nurture a garden, and keep the pesky insects away from it. This is done by switching between the game's two characters – Grell, a gnome who mainly comes in handy for killing the insects, and Falla, a fairy who flies about sprinkling various dusts on the garden to make it grow. It may sound easy, but soon becomes fast and furious as you desperately switch characters to kill insects in some far-off corner of your garden! 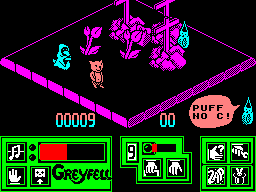 The graphics are fine – quite colourful and cartoony, as you would expect from Code Masters – and the sound effects are OK too. It's just the game itself didn't grab my attention. A passable attempt at a very different genre of game! The town of Kingston Falls has been overrun by Gremlins. You are Billy, who was responsible for introducing them in the first place, and you must now rid the town of the Gremlins by any means possible. 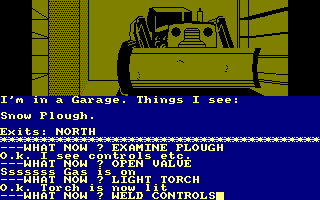 This is a text adventure with illustrated graphics for several of the locations. A nice touch is that the pictures change based on events; for instance, if you have killed a Gremlin, the picture will show the Gremlin's corpse. However, all of these graphics may be the reason why the parser is fairly limited, though if you have seen the film that the game is based on, you will recognise a lot of the puzzles and have an easier time solving them. See also: Gremlins 2: The New Batch. 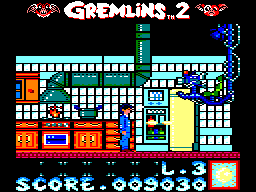 Gremlins 2 has, in my opinion, some of the best graphics on the CPC. You're Billy Peltzer, from the film of the same name, and you have to battle through the Gremlin-infested TV studios where you work. It doesn't sound like much, but the game is seriously fun! Characters from the film are instantly recognisable, and the Gremlins come in all sorts of different guises. The sound is pretty good, too, but this game is all about the graphics! Giant Gremlin faces appear on huge TV sets as you pass, and the spider boss is one of the best-looking bosses ever! A truly great film licence. Be warned though, it is quite easy, and shouldn't pose too much of a problem to a seasoned gamer. Not that it matters, because you'll be coming back to finish this again and again! Enjoying a few drinks at the local pub, a cat named Norman the Wise learns that Mauron the Evil One has stolen the Orb of Life. It must be retrieved and returned to the Cup of Sorrows, so that peace and love will reign once more across the land of Greyfell. The problem is finding the Orb, and for that, you will need to find some of your friends, who will provide you with some very cryptic clues. If you can work out their meaning, you will know which object to collect and give to them so that they can help you a bit more. It sounds like a promising adventure game, but it is appallingly slow. It takes ages for Norman to go anywhere, and most of the locations are drab and dull. The mostly monochrome graphics and awful sound effects make things even worse.